Anyone who thinks the ukulele is limited by its four strings and its diminutive size hasn t heard Roy Sakuma play. In liberating the traditional Hawaiian instrument from the usual simplistic chord repertoire, Roy has developed a system to bring the ukulele to the full range of musical forms. The program begins here with an expanded knowledge of chords. The more chords you know, the more you can integrate into your playing. The result is a richer musical experience. 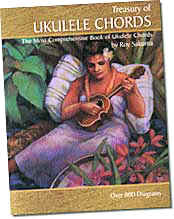 Inside this volume you ll find the first absolutely complete collection of chords for the ukulele. You ll find them carefully organized for ease of application. And you ll find a couple of sample songs, traditionally simple songs, that are enriched by the addition of several of the chords found in this book.